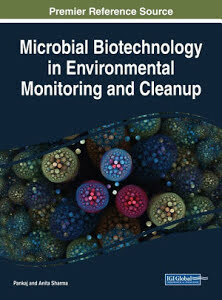 A new book on the advances in microbial biotechnology in environmental monitoring and clean-up has just be published by IGI Global. The book is part of the Advances in Environmental Engineering and Green Technologies Book Series. In the book, the authors state that pollutants are increasing day by day in the environment due to human interference. Thus, it has become necessary to find solutions to clean up these hazardous pollutants to improve human, animal, and plant health. Microbial Biotechnology in Environmental Monitoring and Cleanup is a critical scholarly resource that examines the toxic hazardous substances and their impact on the environment. Featuring coverage on a broad range of topics such as pollution of microorganisms, phytoremediation, and bioremediation, this book is geared towards academics, professionals, graduate students, and practitioners interested in emerging techniques for environmental decontamination. hyper-accumulator tree species has been given proper weightage. The emerging role of nanotechnology in different fields has been discussed. The contents of book are organized in various sections which deal about microbial biodegradation, phytoremediation and emerging technology of nanocompounds in agriculture sector. Chapter 18, which covers phytoremedation, acknowledges that environmental pollution with xenobiotics is a global problem and development of inventive remediationtechnologies for the decontamination of impacted sites are therefore of paramount importance. Phytoremediation capitalizes on plant systems for removal of pollutants from the environment. Phytoremediation is a low maintenance remediation strategy and less destructive than physical or chemical remediation. Phytoremediation may occur directly through uptake,translocation into plant shoots and metabolism (phytodegradation) or volatilization (phytovolatilization) or indirectly through plant microbe-contaminant interactions within plant root zones(rhizospheres). In recent years, researchers have engineered plants with genes that can bestow superior degradation abilities. Thus, phytoremediation can be more explored, demonstrated, and/or implemented for the cleanup of metal contaminants, inorganic pollutants, and organic contaminants.